There are three things that, above all else, you should do in your Spanish exam prep. Doing these will help you ace your exam, whether it is the DELE, the SIELE or the OPI. The three things are: (1) get to know your “enemy”, (2) have a large “linguistic scope”, and (3) practice speaking and writing in Spanish, 1-on-1, with an expert tutor. 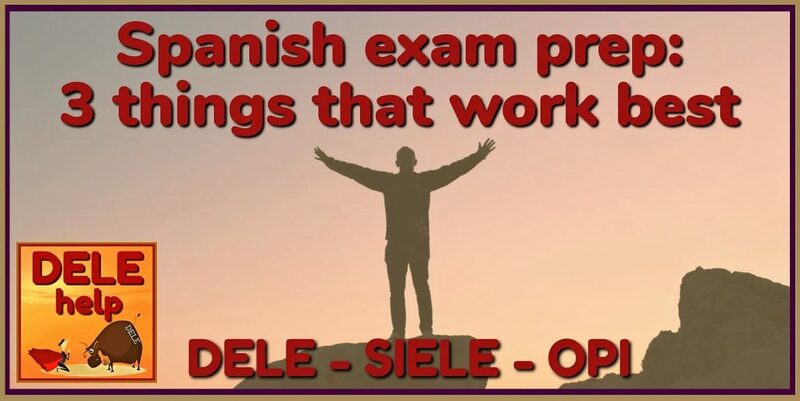 (If you don’t yet know what the DELE, the SIELE and the OPI are, please go to this blogpost: https://www.delehelp.org/dele-siele-opi-spanish-exams-compared/ ). The first thing I say to students who are planning their Spanish exam prep, is that they have to really “know the enemy” to be able to beat it. Find out about your particular exam’s assessment goals, its format, curriculum and scoring criteria. Make sure that you understand exactly what the examiners will be expecting of you. Without knowing this, you cannot develop a proper study plan. Nor will you have the right mind-set for going into exam day. Because without a proper understanding of how different these exams are to school or college exams (they are focused on “communicative competency”, not academic competency) you will likely still think that they are marked like the language exams you knew in school or college. Which they definitely are NOT – they test your ability to USE the language, to actually COMMUNICATE, instead of just having academic knowledge about it. For example, i.t.o. the scoring method used: do you know that, for the speaking and writing tests, your COHERENCE, your FLUENCY and the extent of your VOCABULARY count for three times more of your overall score than does your CORRECTNESS? (of pronunciation, spelling, grammar etc.). The second important thing to do in your Spanish exam prep, is to focus most of your self-study time on learning the lexis of the Spanish language – in other words, its vocabulary plus expressions. This is hugely important for both the comprehension and speaking/writing tests. In the writing and speaking, the “amplitude of your linguistic scope” (i.e., your knowledge of vocabulary and expressions) count for 25% of the total test score. In the comprehension tests it is even more important, because it is obvious that if you don’t know what key words in the text or audio clip mean, you’ll be unlikely to comprehend the message and equally unlikely to get the answers right. Thirdly, get an experienced, knowledgeable tutor with whom you can practice, 1-on-1, to express yourself in Spanish, whether it be in writing or speaking. Because the one thing that you clearly cannot do by yourself at home, is practicing conversation by yourself. Nor will your writing practice have full value if you don’t have an expert to review it and guide you. Prepping for these exams is all about PRACTICE. Which is why one-on-one tuition is streets ahead of wasting time in group classes where you are held back by the lowest common denominator and where you have to share your part of precious prep time with how many others. Let’s get into some more detail now, and also point you to resources that will help you get to grips with these three keys to success with your Spanish exam prep. To really get to know what will be required of you, you will need to do two things. One is to read up about these exams from a source describing them in plain English and from the student perspective – from the point of view of explaining what skills these exams are actually set up to test, and how. The second is to do as many model exams as possible, to gain first-hand insight through practice, doing so with an expert tutor who can explain to you where you fall short and why (and how to remedy that). You have to understand what the goals are that these exams are devised to accomplish (in brief, to test and certify your practical, real-world ability to actually communicate in Spanish – i.e., to understand what you hear and read, and to be understandable when you write or speak). Get familiar with the exam format, which is structured to test your real-life “can do” ability with regard to the four communicative competencies (listening and reading comprehension, plus written and oral expression). Obviously, you have to know what content you will be tested on, so you have to familiar with your level’s curriculum (for example, in the DELE / SIELE the Subjunctive Mood isn’t tested at levels A1 and A2). The most important part of the DELE / SIELE curriculum is the “functional language use” chapter – what is called in the OPI system the “can do” statements. These identify the actual tasks that you must be able to perform at your level, and about which you will be tested. (Grammar constitutes just one of the 12 chapters of the DELE / SIELE curriculum). And finally, you have to be very clear about the scoring criteria that the examiners will apply to assess your written and spoken expression (they will evaluate, with equal weight, four things: your coherence, linguistic scope, fluency and correctness – which we will come to in a moment). The best sources for getting this information, in English, written from the perspective of the students’ needs, are our FREE in-house Workbook #9, as well as the detailed posts in this DELEhelp blog. If you click on the image above for the Workbook, you will be taken to a contact info form that will enable us to send you the download link FREE, without any obligation. By clicking on the image of a particular post, such as how the final pass/fail is calculated (below), you will be taken to that post in this blog – or you can look in the “archives” column on the right and select for yourself. I know that most students, when they ask me for my top three tips, probably expect me to refer them to aspects of grammar to study. Like asking the teacher at school what content to “spot” for an upcoming test. Things of the kind that your school teacher would have identified – like mastering the Subjunctive Mood (if you aim for a middle or upper level pass). Or to get clarity on when to use “ser” and when “estar” (for the lower levels – and beyond). Of course, these certainly are useful things to master, and you must definitely get around to them. But you can already see that they are nowhere near the top three priorities for these communicative exams (even though they may be in school or college-style exams). Once you know what the four equally-weighted scoring criteria are, and how they are applied, you will clearly understand how differently you will have to prepare yourself for these exams. In essence, these exams test your ability to convey a clear message, and whether you understand the messages that you receive. This they do by testing whether you can maintain a coherent and fluent conversation, plus: can you express yourself correctly, and with a sufficiently ample linguistic scope? (i.e., have command of the words and expressions needed, with which to clearly formulate your message). The fundamental difference in objective between school-style exams and these “can do” tests, speak from the results that the ACTFL (American Council on the Teaching of Foreign Languages) encountered when they did a survey about ability to actually maintain a conversation. They tested students at senior school and college level, who majored in a foreign language. 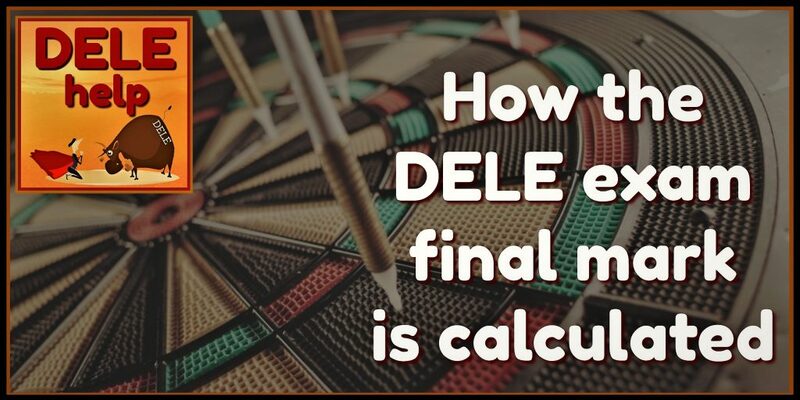 The result was: only 0.5% could – proof enough that if you prep for the DELE / SIELE & OPI like you would have approached a Spanish exam in college, you would stand a 99,5% chance of failing. It’s not merely about what you KNOW, it’s all about what you CAN DO. When it comes to format, the DELE/SIELE/OPI exams vary but slightly (mostly due to different technologies used – the DELE being an old-style “pen & paper” exam, and the SIELE / OPI using computers with online technology). However, the goals and the approach to assessment stay the same for all of them. In the case of the DELE, there is no flexibility – all four the communicative competencies (i.e., reading and listening comprehension, as well as oral and written expression) are tested in sequence, in one exam. In the case of the SIELE and OPI, because of the modern technology they use, there is much more flexibility. You can choose which competencies to be tested on – either just speaking, or all four, or any combinations in between – and one which days you want each tested (if you have selected more than one competency to be tested on). Next I’ll will give you pointers about the most important (and rewarding) traditional learning (i.e., memorizing) challenge that you must take on, in order to do well in these exams – which is: expanding your lexis. As I’ve indicated earlier, your “linguistic scope” is one of the four equally-weighted scoring criteria used in assessing oral and written expression in these communication-based Spanish language exams. For the comprehension tests, a broad knowledge of lexis is actually even more important, because if you don’t know the meaning of key words and expressions used in the reading texts or audio clips, you won’t be able to understand what is truly meant in the particular piece. for the so-called cognate words (i.e., those with common roots and similar meaning) in both languages. They constitute the 38% of vocabulary that is common between Spanish and English. To give an example of such a conversion pattern – words that end in English on “…ce” will in Spanish end on”…cia”, such as police / policia and ambulance / ambulancia. If you know these patterns, you will have a huge instant vocabulary and will know how to spell and pronounce them correctly. At DELEhelp we have developed two in-house workbooks, specifically to help you expand your linguistic scope. The first of these (DELEhelp Workbook #4), helps you master the use of flashcards and the art of cognate conversion. It also provides you with a list of the thousand most frequently used words in Spanish (culled by supercomputers from hundreds of telenovela episodes, so this is real-world Spanish). The second (Workbook #5) introduces you to the most commonly used Spanish expressions – particularly the very important “link phrases” or “connectors” that the examiners are so keen to see you use, because they help ensure coherence and fluency. The modern digital flashcard systems undoubtedly are the key to effective learning of lexis. You can use flashcards to memorize words and expressions – not only i.t.o. meaning, but you can (and should) add the gender of nouns, and the conjugation rules applicable to individual verbs (whether they are regular / irregular etc.). The beauty of the modern flashcards is that they help you escape the soul-deadening boredom of trying to memorize printed lists of words. It is like playing chess against the computer – systems like Cram.com (which is free) make the learning process interesting by playing games with you, whilst all the time sorting the words that you already know from those that still challenge you, and keeping you focused on the latter. When you have set up your flashcard system, it is very important to be diligent in maintaining and expanding it. Every new word you encounter, whether reading or listening, must be jotted down, looked up in a good dictionary (like the free online dictionary by Farlex) and then incorporated into your flashcards. The more you read Spanish, listen to Spanish talk radio or watch telenovelas, the bigger and better your linguistic scope will get – if you discipline yourself to note new words on flashcards and then actively learn them, as your most important self-study general assignment. We know today, thanks to neuroscience, that our brains process the acquisition of language in the same way, using the same brain circuit that we employ to acquire the skill to dance, to play the piano, or to play golf – any skill that we perform. In the case of sport, we talk about building up “muscle memory”, which is the ability to reflexively play that tennis backhand shot because we’ve internalized – through much practice – the patterns of the movement. Knowing what to do isn’t equivalent to being able to actually DO: as a total golf hacker, I can go out and buy every book ever written about the sport and study them exhaustively – but that won’t help me beat Tiger Woods. We know that this is true also for language: speaking our mother tongue, we don’t for a moment consciously think about grammar – we do it reflexively, on the basis of the lexis and patterns of the language that we’ve internalized through constant practice. It is probably fair to say that the vast majority of any population don’t have even the most basic idea about the formal grammar of their mother tongue – yet they all speak it correctly (mostly). We know that nobody sits down toddlers to actively teach them language in a formal, grammatical way like in school – they observe and practice (and unlike us adults, they don’t have ego hang-ups about making mistakes, which keeps us from opening our mouths, and thus from practicing). By trial and error toddlers internalize what the right words are for describing particular things or actions. Constantly they practice the correct pronunciation, and stringing words together in the correct patterns. And lo and behold, after five-six years they speak with confidence and clarity, before they’ve received one day of schooling. Although language handbooks are very valuable tools that are available to us adults when we aim to acquire a new language, they aren’t a substitute for actually practicing to speak and to write. Practicing writing one can (and should) do by oneself at home, but to gain full value, you need an expert to review your written assignments and to guide you i.t.o. necessary corrections. However, practicing conversation is simply impossible to do effectively in front of the mirror, on your own. Even the best interactive computer program isn’t going to help you with practicing true conversation either. You need an expert interlocutor, who can correct and guide you, 1-on-1. Earlier, I mentioned the 0.5% result that the ACTFL found when they assessed how well traditional foreign language schooling actually equips students to maintain conversations. This statistic also explains why enrolling for group classes to prepare for exams such as these, is usually a waste of time and money – you need opportunity to practice, not just to sit there and listen, and that can best be achieved 1-on-1 with an expert tutor who not only knows Spanish, but also the ins and outs of the particular exam for which you are prepping. Such conversation practice with a tutor isn’t just idle chatter – it needs to be structured, simulating the exam itself (for example, using appropriate photographs as conversation triggers, such as the DELE and SIELE interviewers typically use). The practice conversations should ideally be recorded, for subsequent review and so as not to interrupt you in mid-stream to correct a word or phrase here and there – particularly when practicing for gaining fluency and coherence is so important i.t.o. the scoring criteria that will be employed in the exam. It speaks for itself that, in the normal course of such conversation practice, any problems that you have with correctness of pronunciation, grammar, choice of words and the like, will naturally come to the surface and will be attended to. This means that such conversation practice isn’t just preparation for the oral test, but for all of the elements of the exam. 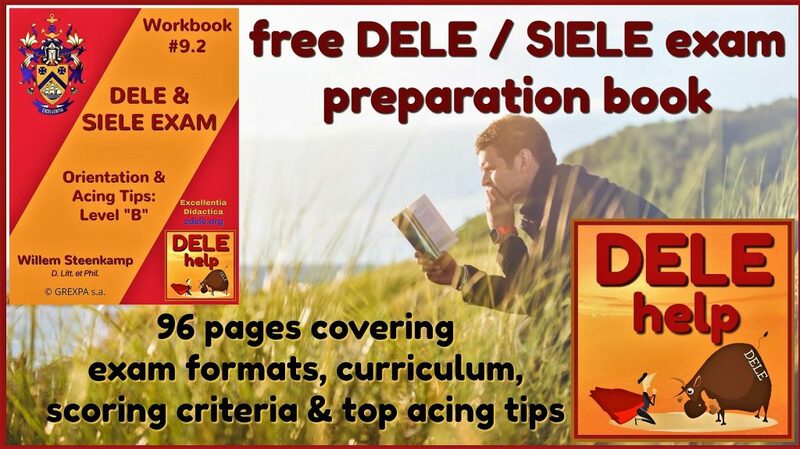 Please take note that you can ask to receive a free download link to our 96-page in-house Workbook #9.2: “DELE/SIELE exam orientation and acing tips” by sending me an e-mail to: ws@edele.org or by filling in the convenient contact info form on this page. It will certainly help you in your Spanish exam prep! Buena suerte with your preparation!